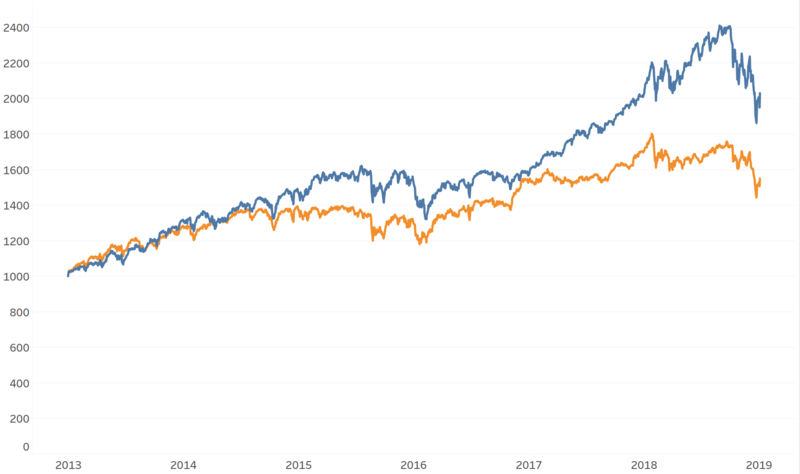 The chart below shows that for several years, growth stocks strongly outperformed value stocks. In plain terms, that means that already expensive stocks got very expensive, and already very expensive stocks then went on to get very, very expensive. That pattern reversed in the 4th quarter of 2018. 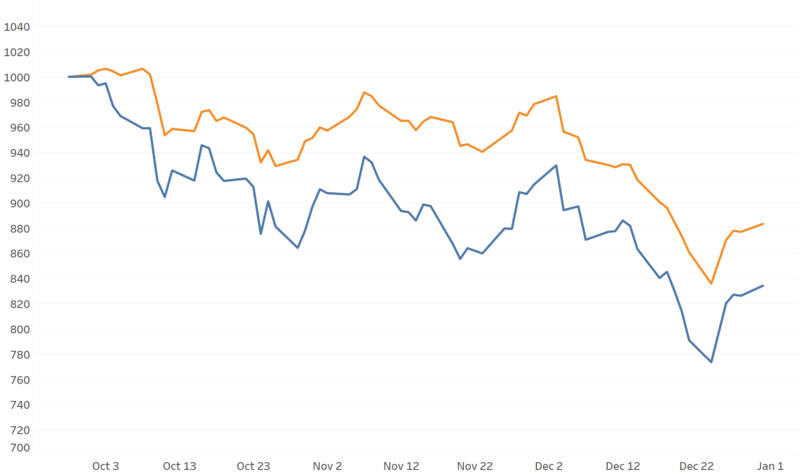 Both expensive and cheap stocks sold off, but expensive sold off more. Gravity re-asserted itself. 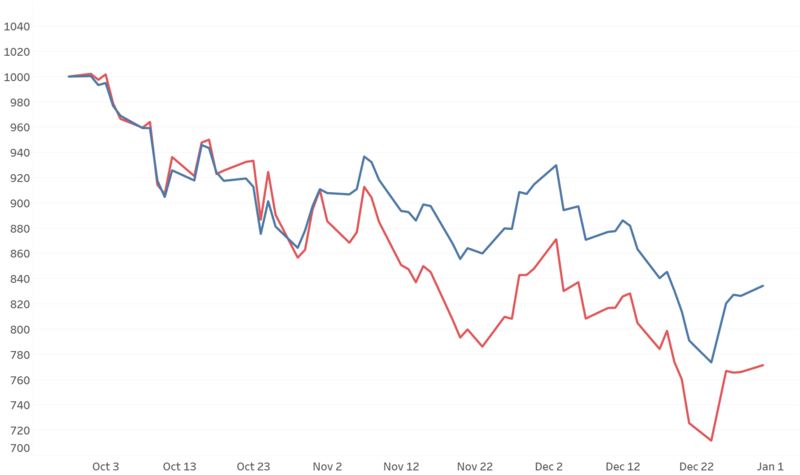 Taking a closer look at growth stocks yields additional insight as we see below that FAANG was the driver of growth outperformance. In other words, FAANG was the growth section of ‘Growth’. 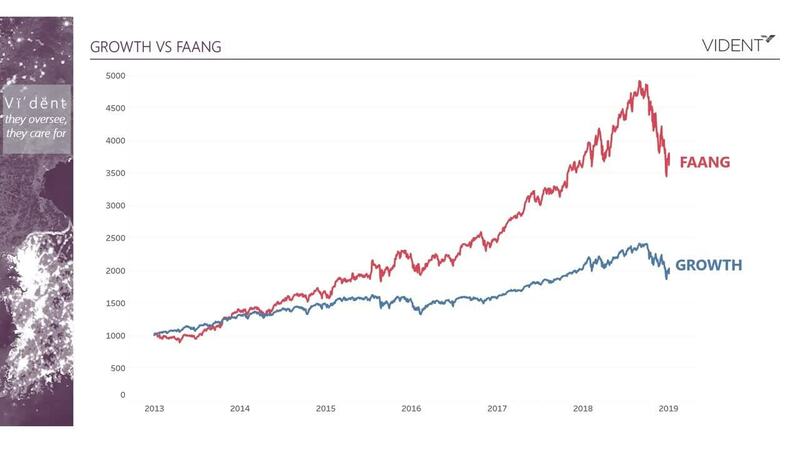 As the chart above shows, FAANG -- which had been the source of the growth of ‘Growth’, leading the way upwards -- turned around and led the way downward in the 4th quarter. 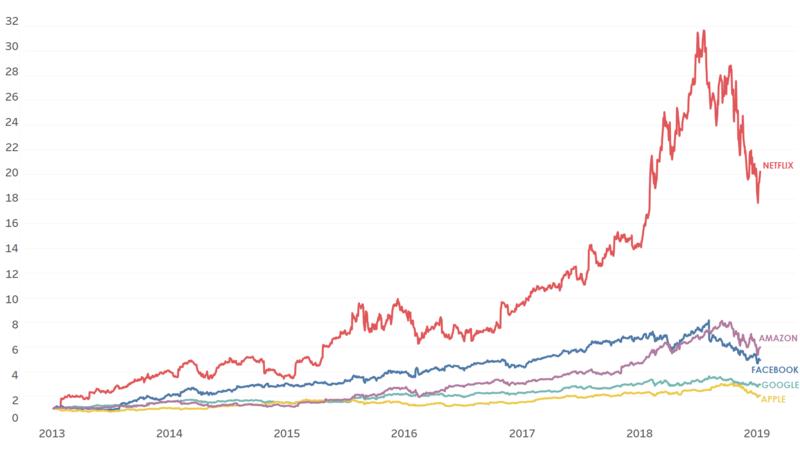 Over the past several years, Netflix, Amazon and Facebook were the big performers. Facebook, however, sold off in July 2018 (Q3) in the largest single day loss of dollar value in American history. The two biggest overperformers in the group, Netflix and Amazon, were two of the three worst underperformers in the fourth quarter. 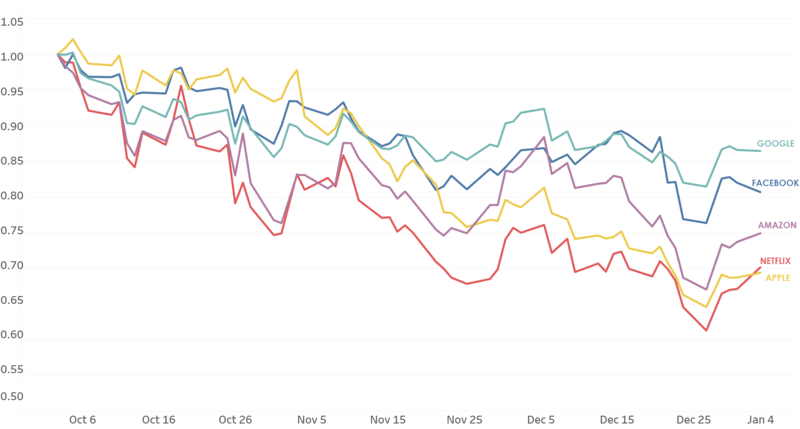 The third highest long-term performer, Facebook, was not among the worst performers in Q4, but that's because it sold off early, making it one of the worst performers in Q3. 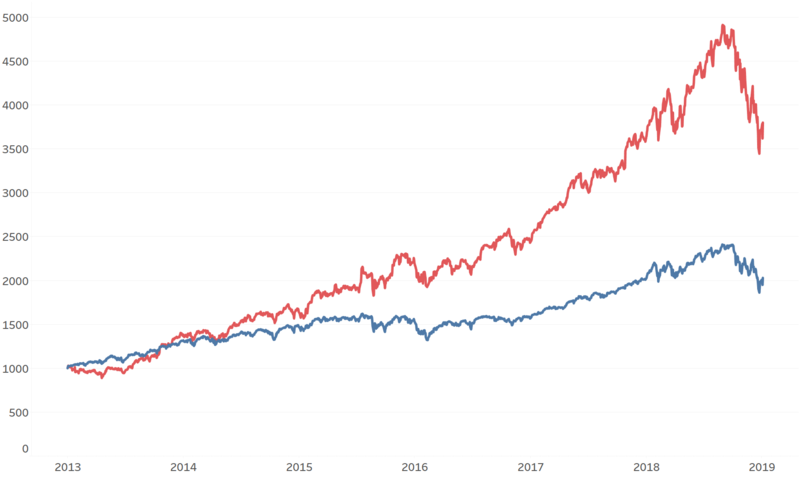 Investors who got caught up in momentum prospered for a time, but eventually fundamental principles like inherent value (valuation) and leadership and governance reassert themselves. You can also watch a video covering this topic below. The fund's investment objectives, risks, charges and expenses must be considered carefully before investing. The prospectus and summary prospectus (VIDI, VUSE, VBND) contains this and other important information about the investment company, and a free hardcopy of the prospectus may be obtained by calling 1-800-617-0004. Read carefully before investing. Holdings information for each fund as follows: VIDI, VUSE, VBND. The Vident Funds are distributed by Quasar Distributors, LLC. The fund's investment advisor is Exchange Traded Concepts LLC. VIDI, VBND, and VUSE's sub-advisor is Vident Investment Advisory (VIA). Vident Financial owns the indexes that underline the funds. Quasar is not affiliated with Vident Financial, Exchange Traded Concepts, or Vident Investment Advisory. Quasar is not the distributor of FLAG ETF.